One afternoon out of sheer curiosity I decided to google the origin story of Los Angeles’ Griffith Park. At first it was unremarkable, a large tract of land donated to the city by a wealthy resident. But it didn’t take much digging to discover the strange & violent history of LA’s most famous public space. I took that curiosity & created this little short documentary exploring the weird early life of this landmark & the man who made it possible. You can read the full narration text plus additional information (there was too much weird stuff to fit into just one 3 min video!) in my earlier blog post. & remember: the history of your local haunts is often weirder than you can even imagine. I’ve spent the last few weeks learning the strange & sometimes sordid history of Griffith Park & it’s namesake, Griffith J. Griffith, for a short documentary I’ve been working on. As is usually the case, much of my research for the film didn’t make it into the final cut, so I thought I’d share it here along with a couple of photographs I’ve been having a fun time “vintage-ing” up. It’s fun to think of LA in a bygone era. The history of this place is especially interesting to me because LA so frequently stands in for somewhere else. Sometimes I think that means we forget it has its own quirks. Griffith Park’s initial 3015 acres were donated to the city of Los Angeles on December 16th 1896 by the wealthy industrialist Griffith J. Griffith. He had originally purchased the land to host an ostrich farm which he intended to use to lure Los Angeles area residents to his nearby housing development. Born in Wales in 1850 Griffith immigrated to the united states at age 15. By 1873 he was living in San Francisco & managing a local publishing company. In 1878 he became a mining correspondent for a local newspaper. He would eventually use his knowledge of mining to amass a large fortune, estimated to be upwards of 1.5 million dollars at the time of his death. Married to Mary Agnes Christina Mesmer in 1887, he had one child, a son born in 1888. On September 3rd 1903 his pristine reputation was tarnished when, while vacationing in Santa Monica, he shot his wife Mary in the head. The shot did not kill her, but she was permanently disfigured & lost her right eye. Griffith was charged with assault with a deadly weapon with intent to commit murder. During his trial Mary revealed in her testimony that Griffith, who was generally thought to be a teetotaler, was actually a secret alcoholic who had frequent paranoid delusions. He was found guilty of the lesser charge of assault & spent just two years in prison for the crime. During his incarceration, Mary was granted a divorce on the grounds of cruelty & full custody of their son. As part of the settlement, the court required Griffith to pay for the boy to attend Standford University. Mary Griffith’s divorce decree was awarded after a record breaking 4 minutes of deliberation. In 1912, Griffith donated a large sum of money to the city of Los Angeles earmarked for the construction of an observatory, theatre, & children’s camp in the park. Because his conviction, the park council refused the donation on moral grounds. The money, however, remained in a trust until it was eventually used for the construction of the Greek Theatre in 1930 & Griffith Observatory in 1935. The theatre was initially underused & spent some time as a barracks during World War II. 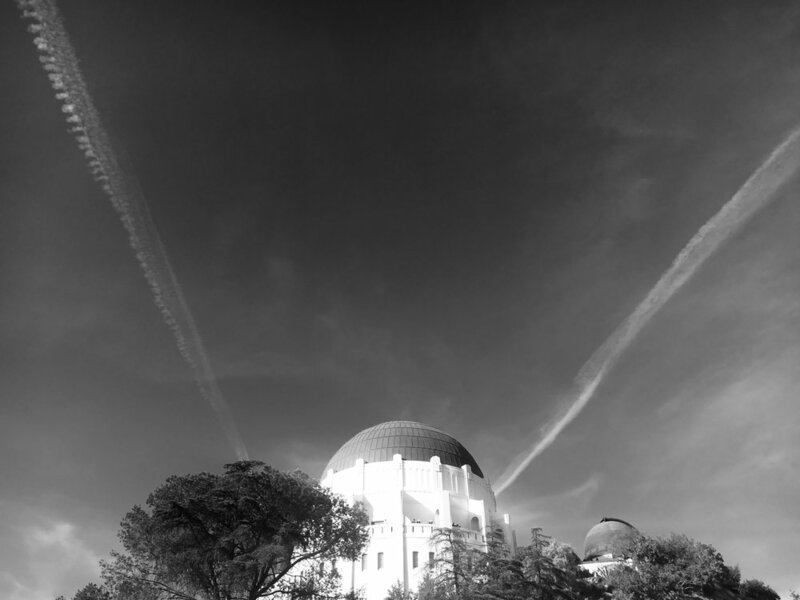 Griffith Observatory is perhaps one of the most well known projects of the Works Progress Administration—the New Deal project begun by FDR in the wake of the Great Depression. The observatory’s famous Astronmer’s Monument was built in connection with the Public Works of Art Project, a division of the WPA which specifically sought to employ artists for the “embellishment” of public buildings. One of the five sculptors on the project, George Stanley, was also the creator of the now infamous Oscar statuette. Throughout his life Griffith frequently used the title “Colonel”, though there are no official military records of his having achieved this rank. His only record of service was with the California National Guard. Griffith J. Griffith died of alcohol related liver disease in 1919, leaving the bulk of his fortune to the city of Los Angeles. He is buried in Hollywood Forever Cemetery. Griffith Park is one of the largest urban parks in the United States. Begun as a WPA project in 1933, Griffith Observatory opened to the public in the spring of 1935. in accordance with the will of its benefactor, Griffith J. Griffith—who donated the surrounding 3000 acres of land to the city of Los Angeles in 1896—admission to the observatory is, & always has been free. Upon its completion, Griffith Observatory was only the third planetarium in the United States. Closed for major renovations from 2002 to 2006 the observatory is one of the most recognized landmarks in Los Angeles. Mr. Griffith donated the funds for both the observatory & Griffith Park’s Greek Theatre. His donation, however, was blocked by the park council after his image as a philanthropist was tarnished when he attempted to murder his wife in 1903. He would eventually spend only 2 years in prison for the crime. A secret alcoholic for much of his life, Griffith died of liver disease in 1919 leaving the bulk of his fortune to the city of Los Angeles. the arts district is a once gritty neighbourhood on the eastern edge of LA’s downtown. formerly an industrial area with buildings that date to the early 20th century, the arts district is now home to art spaces & cafes, as well as repurposed factory & warehouse buildings. the transformation of the area began in the mid 70’s when a group of california based artists saw potential in the empty industrial buildings & began converting them into studios & commercial spaces. by the 1980’s the city of LA created a special “artist in residence” zoning variation to regulate the often unsafe conditions of the repurposed buildings. because much of the area was originally abandoned its rise doesn’t qualify as traditional “gentrification”, though the area’s popularity is increasing right alongside the rents on the live/work spaces it is known for. by 2014 the average annual income of arts district residents was $120,000.